Agricultural Waste Management: Problems, Processes, and Approaches is a summary of the processes and approaches applicable to the solution of agricultural waste management problems. This book is organized into three part encompassing 13 chapters that is intended as a bridge between theory and practice as well as between the many disciplines that are involved in agricultural waste management. The primary focus of agricultural waste management is on the obvious problems of odor control and feedlot runoff. The first part looks into the status of agricultural waste problem and the application of engineering and scientific fundamentals to the management of these wastes. This part also deals with the role of the land in waste management, and then outlines the guidelines for the development of feasible waste management systems. 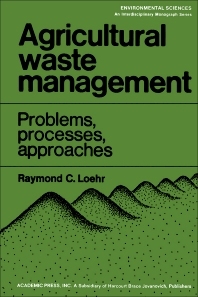 The second part describes the fundamentals, principles, and benefits of various waste management processes, including biological processes, ponds and lagoons, aerobic, anaerobic, physical, and chemical treatments, and nitrogen control; as well as treatment systems, such as ponds, lagoons, and land disposal. The third part examines the integration of the most economical and equitable combination of alternative technologies into feasible waste management approaches. This work will be of great value to agricultural producers and manufacturers, scientists, and engineers.